I can't believe that we don't seem to have a Klaus Egge thread yet ( ;D). Anyway, a strong recommendation for some of this interesting Norwegian composer's work. In particular the fine 1st Symphony, dedicated to the Norwegian merchant seamen of World War Two. It is rather waltonian, with echoes of the sea. There is also a rather lovely string quartet on Naxos (in '20th Century Norwegian String Quartets') and a CD of piano works. Like Braga Santos (remember him?) he went all atonal later on and I find these works less appealing (ie Symphony 2 etc) but others may disagree. Heard the name, but do not know the composer in dept. I heard a few atonal works from him, and that put me off big time. I did not know he wrote Waltonian works in the pre-atonal years. Will certainly dip my feet carefully in this music. I can't believe that we didn't have any thread on a Norwegian composer - even Grieg! To anyone who likes his later music - are there any similarities to Fartein Valen? Try one of the two Naxos discs, especially the String Quartet or Piano Concerto No 2 as a sampler. If you like those I'd very much recommend the completely tonal First Symphony, which I found years ago on an old Phillips LP wirh Karsten Andersen conducting the Bergen PO. A fine, if rather boxed-in recording (same one as on the Aurora CD). Yes, I noticed that too about the lack of Norwegian composers (although there is a Scandinavian composer's thread). Unfortunately I am unfamiliar with Valen's works. I'm also quite inexperienced with Valen, but found his lieder on a Simax disc quite refreshing/interesting. Thanks for starting this thread, I have heard Egge's name mentioned several times on GMG but know nothing about him. Klaus Egge. I first acquired some Egge in the early 1970s when Norsk Komponistforening(The Society of Norwegian Composers) sponsored a short series of LPs on the Philips label(remember that?). The Egge Symphony No.4 was coupled with Finn Mortensen's Fantasy for Piano and Orchestra and Egil Hovland's Lamenti for Orchestra. Then in the late 1980s Aurora transferred some of this music to cd. Since then there has been relatively little Norwegian music issued although recently the Simax label has issued a few discs with music by Norwegian composers. BIS has recorded most of Saeverud's orchestral output, some Geirr Tveitt, some Eivind Groven and is midway through a Fartein Valen cycle. I DO really write TOO much at times, don't I? Amazing how a word with so little content,* atonal, should be the kiss of death for so many listeners. Indeed, all anyone on a music board has to say is "atonal" and immediately several others will decide not to listen to the music so designated. Good job. Discourage people from listening to music. *I would be interested in how Vandermolen or Harry define it, since most of the various (I counted six at one point) definitions of "atonal" do not cover the 12-tone technique that Egge used late in his career (and beginning with symphony no. 4, not 2, which is as tonal as any of his other works before the 4th). I personally enjoy the work of his countryman Geirr Tveitt much more (such a sad story there), but I do enjoy Klaus Egge's works a bit. The aforementioned disk with his second piano concerto is great. There is also a disk (on Simax, I believe) that features his piano works, with Torleif Torgerson playing. It really is quite similar to Tveitt's music, and I imagine that all of those lost works by Tveitt would be quite similar to what Torgerson played on that disk. In response to some guy. I am not a musician but I guess that when I refer to something as being 'atonal' I mean that there are no recognisable tunes or themes. I am trying to appreciate such music more and, for example the 'Facetter' Symphony of Karl-Birger Blomdahl, symphonies by Nordgren and Symphony 3 by Hoddinott are works that I have come to appreciate more and more and I think they come into this category - but maybe not. Hoddinott's work is described as 'encroaching on tonality' but I am not entirely sure what this means. I do not understand the technicalities of music and just go by gut reaction to particular sounds. Thanks for satisfying my curiosity, vandermolen. And I hope I'm not out of line to point out that I don't think anyone could have derived that meaning from your post alone. That is, someone who already knows you or who has seen several similar posts of yours might be able to. No one else. I'd like to add that the word "recognisable" points somewhere else than to the music. It clearly implies a "recogniser" or at least a listener, who may or may not recognise this or that particular thing. Some listeners don't have any trouble hearing tunes and themes in any of the music you've identified as "atonal." What remains unchanged in all this is the negative connotation of the word. Most people who use that word (by no means all) use it to identify something as bad. Something that they avoid, and perhaps, by extension, something that other people should avoid too if they know what's good for them. ;) But if "atonal" is anything like "recognisable" (and I obviously think it is), then it too says nothing about the music itself, only something about the auditor. And not all auditors are alike. I applaud your efforts to enjoy more things, by the way. Only good can come of that kind of activity!! I find both Valen and Egge easy to enjoy, and it only takes one hearing to get to that point. As some guy indicated, the "atonal" description tells us nothing. For my money, anyone who treasures Prokofiev or Shostakovich will likely find Valen and Egge very rewarding. It is Egge's most modern sounding work ;D I am afraid that I haven't taken to it yet. It is Egge's most modern sounding work ;D I am afriad that I haven't taken to it yet. Today I decided to have a proper listen to Egge's Symphony No. 4 (Sinfonia sopra B.A.C.H - E.G.G.E.) from his more modernist period. I have to say that I enjoyed it much more than before. It is a dark, gritty work in one movement of just under 23 minutes. Maybe I am getting more adventurous in my musical tastes with age 8). I shall certainly be listening to it again. There are some imaginative orchestral effects incorporating the piano and a sense of urgency throughout. Symphony No. 1 remains my favourite but I have enjoyed this score. I've been enjoying a Simax CD of his chamber music. I find his style both engaging and distinctive. 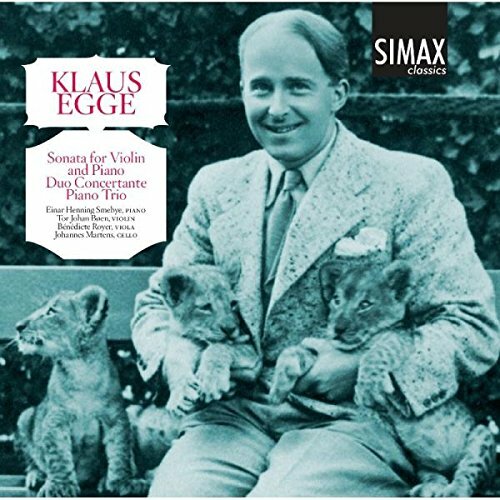 I also like the photo of young Egge,smiling for once, with the lion cubs. And don't forget to wear these to enhance your Birtwistlening experience! I will not be having a 'Birtwistlening experience' thank you very much. Seriously,now;that sounds quite intriguing. I often like symphonies that incorporate a piano. Like Martinu,for example. Fricker in his First symphony. Me too - also Shostakovich's 1st Symphony and Maximilian Steinberg's 2nd Symphony (which I suspect may have influenced Shostakovich, his pupil, in it's use of the orchestral piano).